I think that the author might have put those people in there because he wanted let his feelings out and say how stubborn those people really were. The king in the story could’ve been the author’s boss or maybe one of his parents. The Vain man could’ve been someone that was in the army that thought he was the best and he could conquer everything. The drunkard could’ve been one of the author’s family members that drank a lot and didn’t really have time for anything else but drinking. The business man might have been a person that always wanted all of his work done and worked too hard but didn’t care about any of the important things in life. The lamplighter could be someone that worked so hard at their job they didn’t have time for sleeping, it could’ve been a student that worked so heard on their homework they got straight one hundred percents on their report card all year through. Lastly the geographer could’ve been one of the pilots on the plane that only cared about the navigation. I agree with you Sarah. I think the author wanted to express what he really thought about people he knew. I think that the way you wrote was fantastic. The author was definitely trying to explain how the characters have an affect on his own life and friends or people he knew. Thanks I tried to think of what happened in his real life, and then I thought about who he was trying to tell the story about. Sarah i agree with you. I like what you wrote because a lot of authors do that. They let their feelings out to share with the world. Antoine de Saint had way of writing where you could think of it in a simple way or in the complex way. He has ways to make us think harder about things.But I think that Antoine de Saint is trying to tell us something very important. He is trying to say that people do things to be better than someone else. I think the Vain man represents our school. It holds all of our stuff. The King want to take over control of things when there’s nothing to take over control. He wants to be the one with the power. The Geographer is the files. It holds all of our grades. But it doesn’t hold what we really are like. It doesn’t say our favorite color or it doesn’t say what we are interested in. The lamplighter never gets a brake. He always puts out and lights the lamp. He would like to take a nap one day. But hes always busy. The business is always spending money on stars. I agree with your thinking. I like the part with the geographer the most, it seems so true. It might be school for the vain man but in my article I thought it could’ve been someone that was in the army with the author. You’re right it is an easy and a complex story. The king reminds me of some one that thinks that they are the best person in the world. They dont think of anyone else. They only think about themselfs. They think they rule over anything. They think they can perform any stunt in the world. The business man is another person in the book. He thinks like a grownup. He is differant from The Prince. He is very full of himself. He is like the vain man. Vain man is a character. He is full of himself. He is vain. He is a man. Hewants everyone to like him. I agree that the king thinks he rules over everything. In the story, when the Little Prince asks if he could do something, the king commands him to because he thinks he makes everything happen. I also understand how you say that the buissness man is full of himself because in the book it shows him working so that he can make money so he can buy things to have them and show off how much he has. Last, the vain man is both vain and full of himself. He told the Little Prince to clap for him so that he could bow for himself. I fully agree that the people you talked about are full of themselves and mean to the little prince, but who do they represent in your life? Otherwise you did pretty good with your ideas and your explanation. I agree with you the king is most likely someone who thinks he’s better than everyone in the world. I think when I here what the king is like, I think of Paris Hilton because she thinks she could do everything everybody else does because they only think of themselves. I think Antoine De Saint Exuphery was trying show us what to be and what not be with these six people, including the king, drunkard, Vain man, Business Man, Geographer, and Lamplighter. Antoine has always made us think outside the box, as confirmed by this story, and has two ways to show us things: simple and complex. With the King, Antoine was trying to send us a message as always, therefore the King represents a man who thinks he has all the power, but really he doesn’t have any. The Vain Man represents a person who thinks people who don’t even know him, praise him. But for what? The Drunkard represents a man who is stuck in a big circle in which nothing makes sense, as the Business Man. The Lamplighter represents a person who can’t do something they want to do because of what they have to do, stuck in a daily routine. The Geographer represents someone who doesn’t care about things that die someday, like a flower. These six people show other people what to be and what not be. I can see why you are in this class Nick. I think that is the most detailed explanation and is the most interesting explanation ever. There is no doubt that this is the perfect answer. Good Job! I fully agree with you on all of these people. Antoine is showing you people that you don’t want to be like as you get older. They are all bad examples of parents that probably don’t have much fun anymore. Yah good job i agree that you should of left our class really good. I think that the lamp light represents my mom’s fiance. He works as a truck driver, never getting much rest unless its the weekend. The lamp lighter is always just standing there, working. He never gets any time to rest, although my mom’s fiance only gets two days of full rest. The king would represent a homunculus from a manga called Fullmetal Alchemist. The homunculus thought he gained power over everything, but really couldn’t tell anyone what to do. The king has nobody to rule over, and to tell what to do. The king also doesn’t have all the power he thought he had. The homunculus could also represent the geographer. He only cares for the big things, like power. He doesn’t care for the friendship everyone has to offer. The geographer is just the same. He only cares for the big stuff, not the flower that the little prince mentioned. I agree how you compared the lamp lighter, and your mom’s fiance. How he never gets a break like the lamp lighter. I like the way you compared everything. You are so right about the lamplighter. He barely gets a break. I never new bobit was a truck driver!!!!!!!!! In my opinion, I feel that the king represents the parents. They think that they rule over everything that you do, but they don’t. You control your own grades, and soon your own life. Their power decreases over time, but they don’t notice at all. This is like the king because he thought he reigns over everything when he really doesn’t. Also, I feel that the drunkard is like my uncle about 5 years ago. He was single and would go out with someone. When they would dump him, or he would dump them, he would sob at home. This would make him want to have a girlfriend to get over it. This follows the same circle that the drunkard had going on. Lastly, I say that the business man represents the school leaders. All they care about is the numbers when they don’t really matter at all. It really matters what the teachers do in the class, rather than some test scores that you might have done bad on. Personally, the school leaders are like identical to the business man in the story. I agree with you Kaden. What the teachers do in class is more important than what the school leaders think about numbers. When the teachers teach in class we are learning except when we are taking a test we are thinking hard about something that we already know instead of learning something new. School leaders are a lot like the business man. All they care about is the numbers. They don’t want to hear about how much people improve. You are right and that is true. I agree with you 100% I agree with everything you said, well not about your uncle but about the parents and teachers. I like that you only put one personal connection. That way we can all relate to what you are saying. I fell the same way. You put a very good explanation that i could easily understand. Adults or some of them just worry about work how they get more money to spend on expensive things rather than actually going to do stuff . Very good nice job!! The Drunkard in the story is very difficult. More or less, he’s not friendly. He represents those people in life that THINK there so cool. But they’re NOT!! They’re just people with no lives that do drugs. They’re one of the worst type of people out there. The Little Prince has a big imagination. He’s the total opposite of the other characters in the story! He represents those wise old mans’ that you often see in the movies. With good advice and a different perspective on things. The Little Prince is unlike anyone else in this story! The Buisnessman is a very busy man. As he says. But he’s just a big jerk that likes money. He buys stars, to own stars, to be rich, and buy more stars. He represents the owners’ of big buisness’s that are stuck up. Can never pull away from work and likes to be alone. I truly hate people like that. You’re right Kaitlyn. The drunkard has no life. He just goes around in one big giant circle that he can’t escape from. The business man is just like the drunkard. He goes in circle and can’t stop. All he cares about is money. the more stars he owns the more money he has and the more money he has he can buy more stars. I really like your ideas about the Drunkard, Little Prince, and the Business man. The Drunkard is probably a teenager in the author’s life that does drugs and has no life. I thought the Little Prince was the author because he is looking at other adults who he thinks are strange. The wise old men that you see in movies live like they’re young, and might see them self as the Little Prince. Last, I agree that the businessman only says he’s busy so the little Prince can leave him alone and he can get back to making money. I agree with you. The businessman thinks that he is rich because he owns stars, but he really isn’t. He doesn’t really understand that since he buys so many stars, he is just wasting his money. The businessman doesn’t really understand that he is just wasting his time. I think the business man could represent someone who is never satisfied with what they have. The business man always wants to buy more stars to be rich. He thinks he needs stars and money to be happy. Some people want more things to be happy. They aren’t happy with they have or what they themselves are. The king is representing a kind of person who thinks they are the best and have lots of power. Some people in the world there opinion is the best. But you have to except others ideas. Also the king thinks he has power over everything. Really he has power over nothing but he is so glued to himself he thinks he is special. The geographer is seeing things like he has blinders on. In his job he can only record things that can’t move or can not die. He can only go one way. He won’t take a side step to look at the flower. All he will want to hear is the volcanoes not the flower. Very well worded. I think that how you explained it makes everyone realize they know someone like the characters in the book. Each of these characters represent a different person in real life. All of these people have something that makes them special or vain. The vain man can represent actors in Hollywood. Those people do ridiculous things to get attention. Before that though, the actors want people to watch them on the big screen. They want people to watch them because they are famous and will get more publicity. Think about this, “Does that really matter?” No one has to be famous to be special in my opinion. You can be special in your own way. You don’t have to do bad things so you will get attention. Honestly, if you do a bad thing you will get in more trouble than more attention. The Lamp lighter is like a hard worker who follows orders. When you follow orders you are doing something right. At least nobody will get mad at you if your not doing what you’re supposed to do. The reason why is because you are working instead of sitting around and trying to be noticed. When you work you get attention because you are doing what you are supposed to do and people notice hard workers. The Businessman is a character that is stuck in a large circle. The circle is a little something like this. The businessman buys stars, so he could own more stars, so then he will be rich. He goes in this circle over and over, but really he doesn’t own anything. He just thinks he owns everything because he wants to own everything. You don’t have to own anything. “It’s the experience that matters” (that is a quote from my teacher). He is right about that though.The experience is more important than owning something. I agree with you Drew because there are a lot of famous people like the vain man. The Little Prince has a lot of odd characters. For example, a geographer puts the most important thing about a state, country, or planet. The geographer in the book does not do that. The most important thing on Little Prince’s planet is his flower. The lamplighter has orders to put out a lamp in the morning and put it on at night. But the world rotates every one minute. The Vain Man is all full of himself. When Little Prince comes to his planet he says,”Look I have an admirer.” That reminds me of my dad. He is all full of himself when we walk by him. The businessman is crazy. He thinks because he buys stars he owns the stars which he thinks that he is rich. But where is ll of the money going to? The king thinks he’s in charge. He demands the sun to set at seven o’clock. Not earlier or no later. The drunkard is just like the business man. He is trapped in a circle. He would drink to forget so he can be ashamed. Then he would drink again to forgot so he can be ashamed. The cycle just keeps going and going and going. I agree with your whole answer. Why do you think the characters act this way? if they are all going in circles they will never be able to see anything better than the stupid things. I agree !! very well put but what do you think the authors trying to say you told about the characters and examples but not about the main question! i thought he was trying to say was don’t worry about everything let go and relax as life happens. That makes sense. I agree with you. You made a good point when you asked where all the money would go. I think that all of the characters represent someone in his life. They can also be just people she met. Like the Vain Man and the King. They both represent someone he’s met or knows. The King represent someone that is conceded. He thinks he has power over everything. He says he has power but has absolutely no power. The King says he can make the sun set but it’s just a matter of time before it does. He can’t make the stars move because they move my themselves. So the King just thinks he has power but he doesn’t. Man has to have a reason for people to like him but he doesn’t. I agree totally but, what do you think they can do to not make themselves so annoying to others? The vain man is a lot like that. He just sit around hoping for people to think good of him. Nobody will think good of him if he just sit aruond. he has to do something about it. You are right. The Drunker reminds me of drug addicts. Just like drug addicts drinkers are stuck in a cycle of depression. It’s a cycle that pulls you in more and more. For example the drunker drinks because he’s depressed about his drinking, then he drinks so he’s not depressed. See how it’s a cycle? This cycle is the same for drug addicts. Personally I feel bad for people like this but, it was their choice. So now you can see the comparison of drunks and drug users. I totally get what your saying. that is so true. Skylar i agree with you. It pulls you in more and more and more. But it must be hard to reverse it and be someone better than what you were before. I understand the cycle. It’s their own fault that they cannot stop it. They made their own decisions. That is how you get stuck. I agree with you well said I like apart where you said that it remindes you of drug addicts. I like how you were very descriptive with the way you related the both of them Skylar. I think that the drunkard represents someone I know. The one I know instead of drinking smokes. They smoke because they try to stop smoking, but it doesn’t work, so they smoke some more. A lot of people are stuck in these kind of situations. The drunkard drank because he was ashamed of drinking so he drank more. The vain man reminds me of Ayame from a manga called Fruits Basket. He thinks that everyone looks up to him. He believes that everyone worships him but really, they don’t. He is full of himself because of how he looks and his job. All he talks about is his life barley listening to others. He cuts people off from talking to talk about himself. The vain man believed that the little prince admired him as soon as he came to the planet. The lamp lighter reminds me of my mom. My mom works a lot barely having breaks. Maybe if she is lucky she finishes work early. Most of the time, I never see her get breaks. She just do what orders are like the lamp lighter. Natalie, i agree. so who in your family smokes. I think the lamplighter represents someone who does their job for nothing. The lamplighter could let the candle burn out instead of every few seconds turning it on and off. In the story while the Little Prince asks the lamplighter questions, he will say good morning and good afternoon. In the real world people will do things that make no sense in them doing it. Also, as the years go by his planet turns faster, which makes the day go faster to where he will eventually be turning the lamp on and off every second. The lamplighter doesn’t even have any time to sleep anymore. I think the vain man might be someone the author personally knew, because when he bows he makes it very dramatic. He also has the Little Prince clap for him. The vain man just wants everyone to know who he is, and have everyone like him. This makes him feel good about himself. The author might’ve shown the vain man as someone he went to school with or a grown up he met as a child. The business man might be the author’s dad or someone in his family. I think this because the business man tries to be very serious and says he has no time for the Little Prince. If the author was the Little Prince then someone in his life didn’t have any time for him. The business man is much like the drunkard who is stuck in the same circle. He works to make money to buy stars to have stars and show them off. The business man does this all day so he can own all the stars scientists discover. He is almost like the vain man who wants everything for himself. I totally agree. Maybe the author did know people like this in his life. He probably did. What about in your life? There really isn’t comparison between the story and you life posted. I think you are right about the business man. I think it could be someone in his family. They may have been to busy with work or something and couldn’t talk right now because they are too busy and need to get something done. I like what you said about the lamplighter. I agree that his job is pointless and he doesn’t need to do it. But doesn’t the lamplighter also represent hard workers? He did as he was told and didn’t take a break. That’s kind of a positive trait for the lamplighter. All the characters in the Little Prince have a specific purpose; they all are supposed to be someone in real life. For example, the geographer could be like a parent or a teacher. The geographer only cared about the “important” parts of the Little Prince’s planet like the volcanoes. The flower on his planet wasn’t really important to the geographer. Some teachers or parents could be the same way. They don’t really care about what their kids or students learned, they just care about the tests. Also, in the story the king thinks he is in power, but he really isn’t. He commanded the Little Prince to do things that was already certain to happen, so he wasn’t really in charge. The king could be like an older brother or sister. Many times, your brothers and sisters take “being in charge” much too seriously. They are supposed to take care of their family, but not boss them around. For example, I have seen older brothers boss their younger sister around by making her get their belongings, and they weren’t even hers. Another character in the Little Prince is the vain man. He only cared about what people thought of him. For example, he made the Little Prince say he was cool. The vain man could be like kids at school. They are so worried about how good they look. Many students just want to make sure they are cool or popular, when none of that really matters. What really does matter is showing the real person you are. As you can see, a lot of characters in the Little Prince represent many people that you might already know. Sofia i totally agree with you about the vain man being people at our school. I know so many of them!! I too know a couple of vain men that go to our school. I like what you said about the geographer and not caring about the things that are really important in life. It interested me that you said parents and teachers only care about the test scores. It is very true in many ways. I also liked how you said that brothers sometimes boss other people around. I have seen things like that before too. With the vain man,I like how you relate it to school and kids that think everything is about them. You have very good connections with the characters. The drunkard represents people that have problems. Those kinds of people go in circles. He drinks to make himself feel better and when he feels better he drinks more. People don’t have to be this way but they choose to. There are ways to help but they think their fine and just deny anyone who tries to help. The business man represents adults. Adult only care about the numbers and no imagination. Just because you own something that the next person doesn’t, doesn’t make you better then them. Experiences in life are way more important then having things and getting sick of them then it’s a waste of your money. You don’t have to own something to make people like you or think your rich. The only thing that matters in life is the god experiences in life. The geographer represents someone who wants things to happen and to do things in life. But he wants someone else to go find things for him first. He wants to be successful but he can’t be without an explorer(So he says). He even wanted the little prince to be his explorer. All he does is write big books for no reason. I see your point on how you explained that no one is better than someone else just because they have more money or more skills on something. The geographer is also going in circles. Do you agree? I agree because when people have an issue or something they always go to the same hospital and they always have the same medication. When you need something changed you do the same thing you did with the first medication. The businessman reminds me of the school board and other important people in the school district. All they care about is numbers. ISATs, Discovery tests, and any other tests. They are kind of stuck in a circle. They want us to do good so they get money. They get money and spend it on the school to help us do better so, they get more money. It is all numbers!!!!!! The king reminds me of my little little sister. She is the youngest so she thinks she is in control. She gets away with everything. If she tells me what to do, she does not get in trouble. It I tell her what to do,I get in trouble. This is part of the reason that she thinks she is in control. She gets whatever she wants. This probably is another reason why she thinks she is in charge. The vain man reminds me of my youngest sister again. All she thinks about is herself. She wants everybody to like her. She says she is so fashionable. Me and my other young sister think not. Being in the center of attention eggs this on. She thinks she has power but she does not and she thinks of herself. I think the characters in the book are supposed to represent adults because adults have no creativeness or imagination. Adults don’t always have the right opinions. I think they should be more creative and less worried about every other unimportant things. Also, they should think about something before making a choice because it could end up to be the worst choice of all. I would hate to be that adult who everyone hates because they are always doing stuff and have no time to just lay back and be relaxed. Like the king, adults seem to think that they have total control over other things besides themselves. People are so worried about other people and their decisions that some never get the chance to take a break and worry about their own lives. A similarity that I found was how most of the characters go in never ending circles and I found it to be the same with adults because they always go full circle but can’t ever stop then. Adults never really see the good things in life. They are to paranoid about the future and the bad stuff that they can never live in the moment. I wouldn’t want to be growing up so fast if I were them. The business man reminds me of elected officials like the president or maybe the government or in a small town, maybe even a principal. Of course they all have their special titles and names but, what do they really mean? Sure the president is in control of America and I know that seems big but, he doesn’t control what I do. He has nothing whatsoever to do with me. Some adults don’t even like our president because he is too dumb to realize real matters and issues our country is having. He is just another adult who is worried about unimportant things. This leads me to principals. Principals are also like presidents. They think they are all in charge of their school but, really principals don’t affect some people’s lives at all. This is because if a student gets into trouble they need to think of a better way to handle issues. I think if a decisions is made too fast you might end up on the short end of the stick. All I’m trying to say is if principals are really “in charge”, why don’t they ever handle things right? Overall, I think The Little Prince was a great book and teaches a valuable lesson. I agree that grownups have no creativity. They only care about numbers. To me it seems that is all they care about. I love your whole explanation. I think you are right about the people in the little prince. In The Little Prince book, the King reminds me of someone who is full of themselves. They think they have influence over anyone and everyone they will meet. In the King’s case, he makes demands that The Little Prince doesn’t necessarily want to do, but he does them because the orders are, well what he’s doing. For example, the King tells the Prince to yawn while he is yawning, because then the Prince follows his orders. Kind of. This probably makes him feel powerful and cool. The Vain Man is someone who cares what other people think. They want everyone to like them, because it makes feel better about themselves, or more popular. But really, no one will really like you for who you are if you pretend to be someone you’re not. Maybe they’ll like you, but not the real you. In the story, the vain man has a hat to tip when someone applauds him. This is sort like a fake personality in real life. You only use for people who you want to like you. I know many people like this, and they are really hard to be around sometimes, because you know how they’re acting isn’t the real them. The Drunkard is someone who feels sorry about themselves because of their bad choices, and because if this thy make more bad decisions. Why? No one knows but them. These people are stuck in an endless cycle, just like the drunkard. Getting out of the cycle is hard, but once you do you feel so much better. I know some family members who were like this but fixed it. Now they are so much more fun to be around. The Businessman is someone who is only focused on their work. They love numbers and don’t ‘have time’ for anything else. Most adults are like this. They are too busy to do anything but work. They are tactical and boring. Worst of all, they have no imagination and lack creativity. They always think inside the box, because inside the box it is safe and logical. But sometimes, crazy is how get on in the world. To take chances and be daring. Not all people like the businessman are like this. Some can just be boring and thinky-inside-the-boxy. Some can put you down by being logical, and logical only is boring. No one likes someone who is only logical and in no way creative. I’m not saying logical is bad, but to much is annoying. I think that the businessman represents people who always want more and more things. Some people spend money on things but don’t spend it on things they will always remember. I think it is more important to have memories than other things. You can lose other things, but you can never lose memories. All the businessman wanted was more and more stars. He really didn’t care about anything else. The drunkard represents people who are stuck in circles. Some people keep going in a circle to forget something. They may just be ashamed about something they did. They may do it to forget about what they are ashamed of. They may also do it because they want to forget about it. The drunkard drank to forget that he was ashamed of drinking so he drank to forget. He just kept going and going and going in a big circle. The vain man represents people who want to be liked by everyone. He only cared about what other people thought about him. He thought that The Little Prince was an admirer. He wants to know what everyone else thinks about him. He wants to be liked by a lot of people. He even wants to be liked by people he doesn’t know at all. Some people just want everybody to like them. They may also want people they don’t know to admire them. It makes them feel good about themselves if people like them. The geographer represents people who care about the wrong things. When he asked the Little Prince about his planet all he cared about was the Prince’s 3 volcanoes. He didn’t really care at all about his flower. He explained that his flower would probably die. The Prince thought that grownups care about the wrong things. Some people care about less important things. They don’t care about the right things. They focus a lot on things that will last a long time. I think that he is trying to explain how grown-ups think. It is about how adults think about the boring things. They think about the scores, numbers, and things that will never change. They don’t care about the fun things or the things that you can only enjoy for a little while. He talks about how they only care about what they know and what their score is. He says that adults look at the wrong things. They think only about the boring stuff. He tries to worn kids about acting like they are older then they are. He is trying to tell kids to enjoy being a kid and to act like a kid. The king in the book reminds me of my aunt. The king thinks he has all this power but really all he has is the power to tell people to do what they want to do. He doesn’t really have any power at all. He is like my aunt. She thinks she has all this power but she doesn’t have any power. She tries to be a part of everyone’s day. She also tries to make everyone do what she wants them to do. She likes to try to control people. She does it to her brothers and sister. She never really listens to anyone else. The business man is a lot like my grandpa. He is always very busy. He never has time to do anything fun. He is always working. The business man is almost the same. All he does is sit on his desk on a tiny little planet and add numbers. He “buys” stars so he can have them. He sits at his desk all day counting the stars. Then with the stars he gets rich. With the money from the stars he can buy more stars. And the circle starts again. He never has any time to do anything fun because he pretends to be a serious man. This story is very hard to understand in a deep minded way. The characters like The drunken man, the king, and the vain maker are easily told by how they act. The drunken man he has a alcohol problem easily shown and could be defined . The King could be represented by anyone like a boss parents or anyone with higher power than you. The vain main is someone who knows hes the best and hes not afraid to say and show it. People like the geographer, Business man, and the lamplighter . They could have a toll on the authors life. Like the geographer always dealing with papers look at land formations the usual. The lamplighter always busy not getting a chance to take a nap or anything. the business man very busy always about work. These characters are like a non stop working machine with no time for anyone else. The author is trying to say not to be these people be out and open for new things new ways. They have things that aren’t allowing them to do anything but work. Hes trying to say be open go do stuff see stuff rather than getting money spending and being stuck in a circle. It very easy to understand where hes coming from if you think the same way. The point is just to be like a kid have fun but also be an adult don’t always think to hard let life go as it happens. I agree with you Justin because the Geographer, Lamplighter, and the Business man all have reason to be doing what they are doing. The Little prince met a lot of people on his journey to earth, they were all ridiculous! One of these people was the king. The king believed he had all the power to control anything. He commanded things to happen that naturally happen. The king sees himself with a whole bunch of power but really he is just a regular guy on his planet. He really only cares about the power he has instead of expressing who he really is. The king represents a type of person trying to be someone there not! The Little Prince also met the drunkard. The drunkard to me represents a dead or dying flower. The drunkard is stuck in an evil circle of drinking and there is no way out!! The drunkard has nothing really to live for so his spirit is dying out, like when a flower is hurt by something or nature, it has lost what to live for, happiness. the drunkard isn’t really dying but his soul and spirit is because he didn’t deal with his problems. The drunkard teaches very important lesson that everyone should know, deal with your problems instead of holding them inside because one day those problems will just explode in your mind and then it’s too late! The Little prince also encountered the vein man. When I think of the vein man I think of an tourist attraction. I think of this because the vain man wants everyone to admire him just because, even random strangers! Tourists travel the world to admire things, like the Bean in Chicago for example. Does the Bean really have a meaning in your life and is the vein man worth your time in life, probably not. What I am trying to say is admire things that have some kind of meaning and not stupid things that you will forget about in life. Spend your time admiring things that have meaning and a special memory. The king reminds me of my mom. My mom thinks she controls everything. Even though she’s younger than my dad. Plus, my mom thinks that she needs everything. If she see something at the thrift store that she likes, we have to buy it. I wonder if she realizes how much we have and don’t use. Or if she knows how much clothing she has in her closet and DOESN’T wear. The vain man doesn’t really remind me of anybody i know. But if i did, that person probably wouldn’t hang out with other people. A lot of people wouldn’t like them because of how self-centered they are. If anybody can is leading that life, i feel really sorry for them. I’m so glad i don’t know anyone who’s like that. I think that the author put people in his stories to resemble the people that have bad ideas in the world. Like the vain man people in my life brag about the things they have and what people think about them. Most of the people don’t even think that way about them. They just pretend to feel better about themselves. Also, the drunkard reminds me of people in the world that have addictions. Like drugs or alcohol. The author may have put people like that into his story to show them that they are not the only people like that in the world. That they are not alone. Plus, the geographer is about people who think numbers and letters are the most important thing in the world. When really it’s one of the most unimportant things. It reminds me of people who think they are really smart just because they have better grades. My friend brags about how she’s on high honor roll. This friend is in all of the advanced classes. Once I asked her if she could help me with my homework. She said “Um this is to hard. Find someone else to help you.” She was trying very hard. If she’s so smart, why couldn’t she help me with simple homework? For the Geographer, This reminded me of my neighbor because she thinks that since her mom is a nurse that she all the money in the world to spend on stupid things. When she gets something she has to rub it in my face. She also thinks that I’m jealous because of all the things she gets. But then she almost ran out of money so she kept on buying stuff until she gets more money. The reason the author can help you relate to the story in your own was so if you couldn’t understand what was going on then you can under stand it in your own way. When the book gets complex, you might have to read it a couple of time but if you put it in your own way then you will understand.. I think he does this because he wants you to think out side of the box. Another thing is that he might want you to be different and try different things. I think this because people should go travel different places then get thing you can get all the time. A trip around the world is something you will never forget, but a game or a T.V. will get boring at times. Some people are always the same and they might never change but you can choose to change. This is why i think he is doing this. The person in the book that i choose would be the KING. I choose him because many people that i know are like him. The person that is like him the most is my old friend, he is like this because he always tells me what to buy and what not to buy. I think this getting really annoying because when i got my RC car he told me why did you get one its going to break fast. This is who i think is the king. This is why i think he does this and makes people think like grown ups. I hope i never think like one because i like to think outside of the box. i agree with your idea and respect it because i kinda thought that way to. I think what he is trying to say is that some of the important that you remember. Like the bisness man where he doesn’t care about memories. So really just remember something then buying something and then after a while you stop yousing something. The bisness man doesn’t care what is on the planets he just wants them. So really just remember thing instead of through them out. The geographer doesn’t want to put the flower in the book. He doesn’t want to because he thinks it is not important. But really it is the most important thing on the planet. Just because the flower might change doesn’t mean it shouldn’t be included.The author is really saying is that you should keep the important things and get rid of the boring things. The drunkard doesn’t want people to think of him as a drunk. So the drunkard keeps drinking to forget. But really what is happening is he keeps going in a circle. He thinks people he never seen think of him that way. The author is trying to say is that start over and begin something else. i like your idea about the book. I think that our school is like the vain man. I think this because we are always trying to have people think that we are the greatest school in the whole state of Illinois. We always have cared about our grades on the ISATs because we want to get more money and that reminds me of the Business man because we are always trying to get more money then we use it on cool things and keep going back and forth. So we are stuck in this one circle just like the business man. The geographer is like someone who got their hopes up and then it just went away. When the geographer told The Little Prince that the flower will soon go away, i think he meant that something that you love very much will eventually go away from you forever. Sometimes that is not the case. So I support the way that the geographer thinks but also I don’t like the way he does. I think that the lighter is a little like one of the adults I know. She is always so busy and never has time for anything else. She always complains on how much work she has to do. It gets annoying when she listens to some people and doesn’t to the other. I know she is like the business man because she never stops working. I think the author is trying to tell us that there will always be people in life that are like that, and there will always be. My step dad Dave is a control freak out giant meany. When ever he comes home from work he is so grouchy and yells if something he wanted isn’t done. My sister,brother, and i get yelled at for not picking up dinner or if we have the t.v. remote he FLIPS out! When my step dad Dave gets home, he walks up the stairs all oily from work and throws his hands up like a little kid and says “So what did you guys do all day while me and your mom was at work HUH” ! I just say “Whatever school”. Then there he goes throwing his hands up stomping his feet up the stairs like a four year old.Me, my mom, my sister, and my brother all start laughing at him.So that’s why i think my step dad Dave is like the king in the book as the King. I hate it when he thinks that he is the head honcho but he really isn’t. He constantly yells everyday after work. he also pretends like he is a body builder. When he keeps demanding things sometimes my mom even has to come in and break things up because he just wont stop after he starts. when he starts a fight or before he gets home i hurry and run up to my room….. but he comes and unlock my door but he is too dumb to do that. I think the author Antoine De Saint Exupery is trying to show people the circle of life. Like the Drunkard couldn’t stop his endless circle of drinking. When he shows the business man I think he is trying to show us that you can’t manage everything. I think he shows that the king tries to rule over everything, but nobody wants to be ruled by him. I think that he shows the vain man as a person who is full of them self. I think the lamplighter shows a person who is very loyal and is a very hard worker. I think the geographer shows a man that thinks he has too serious things to do then to leave his study. I think he is a very mean man and because the flower was ephemeral so he wouldn’t put it in his book because he said it would have to be a mountain or something like that. So, I think that this story tries to show you the correct direction. I think what the author is trying to say is that the vain man is full of himself. Like my brothers coach. He is always walking around like he is better than everybody else. He trying to say people like this are mean. And they dont care for anybody else. This author wants us to realize who the characters in the book are for us in real life. One of the characters the Little Prince has met is the Vain Man (we don;t actually know his name). I think the Vain Man is like Ally McPhee. The person I am really talking about, her name isn’t really Ally McPhee but she is exactly like the Vain Man. She thinks that everyone, EVERYONE likes her. I’m not trying to be mean or anything but she doesn’t act like who she really is. When it comes to school she doesn’t act like herself at all. It’s like she’s trying to be another person and that person is someone nobody likes. Not a lot of people like her but some of her friends only like here because of her reputation. I don’t like her because how she acts different here in school. I’m not going to hide it but I think my dad is like the Geographer. In the story he meets the Little Prince. He asks the Little Prince what’s on his planet, his most favorite thing is the flower. But the Geographer says that the flower isn’t important, but it is. So what my dad says to me when I’m cleaning is “Get the big things out of the way first, the worry about the little things.” You might agree, but I don’t agree. I always reply, “But eventually the small things pile up, and get big. Then I have more “big” stuff to worry about.” I think some little stuff is important, but then again that’s just me. I think that all the characters have something wrong with them but know one is perfect so don’t be a bully because there different. You should still be nice even though they do wild phyco crazy things that a whole lot of people would disagree with but everyone is different and have different perspectives on new old shiny or just flat out broken. Have you ever heard the saying you laugh at me because im different but i laugh at you because your all the same its like that except it has to do with many people so let me ref-raise that you laugh at me because im not a business man or a drunkard because who would want to be one but im not a king that thinks he is all powerful and wants to rule over everyone and everything im not a vain man who thinks hes all that when hes just another person like everyone else hes no different i may not be a lamplighter who actually has a real purpose the little prince just doesn’t understand why he does something he is just going to have to do the opposite in another thirty or so seconds its probably not even that so why do why not just rest and sleep and be happy enjoy his own life the way he wants and take orders from someone that’s not there i want to know were those orders came from hes the only one there and the geographer is a weird dude he like Mr.curtis said he doesn’t have sight or is able to grasp what is truly important he made the little prince upset when he said that the flower is not counted in the geographers book that kept track of all of the universes natural a curing events like mountains volcanoes and like stars and space and stuff. I think the author of The Little Prince(Antoine de Saint Exupery) is trying to say about the King, Vain Man, Drunkard, Business Man, Lamplighter, and the Geographer is to not act like them or be like them. Antoine de Saint Exupery is probably giving us a clue to not be a person who wants to be on top everyone and rule them. Or don’t be like the Geographer because the geographer only puts the things that important to yourself. Put the things that are really important like the persons favorite hobby or favorite color. My brother Tupac is 16 and he smokes and drinks. Tupac started off going to High School but know he has to go to Premier. Premier is for people who has low credits and people who has made bad decisions Tupac is one of them. Sometimes when he is at his mom’s house he smokes and drinks with on of my siblings. When he got caught he was in a lot of trouble I was scared for him I cried. I hate when he does it I hope he can stop so he can have a good life. He doesn’t know what to do. I hope he can stop and try to start over and have a good life. it all depends on him. I know he can do it I BELIEVE in my brother, Tupac. I think the author is trying to get us to know the world. He wants us to have a better understanding of people by showing us people in the book. People might think that the king is a guy who only rules what he thinks he rules, but no it’s much more than that. He wants people to know about the people in his book so we can compare them to our life. To me the king is my sister. Everybody has at least one person in your life that you have meet to be based off of or like the seven people in The Little Prince. For me the Geographer is a group of people. He reminds me of the people in high rank like Mr.King and Dr.Polinic. They don’t see the important stuff. They only see I.S.A.T.’s and D.A.R.’s. They do that becuase they want money. I am being honest right now and for me to do that i have to believe that is the truth. The geographer right down the things that he thinks that count for the “important” things. The business man reminds me of a guy that i know that you may know too. He thinks he is better than me by bragging about what he has. He is to full of himself. Even if he knows that i don’t want to be his friend he still goes on and on and on about his life. He doesn’t know that nobody is perfect. For him to think that is like for me to say that i would break an X-box 360. I agree with hayden on the geographer. Mr. King, and Dr. polinic don’t understand the importance of the school, they only concentrate on the things they want not what we want. And the geographer thinks he is in a high powered class and Mr. King and Dr.Polinic don’t know how much power they do or don’t have. And how you were saying about the business man, i think some people brag about what they have just like the business man because the business man doesn’t know what he’s doing, he just wants stuff and to do nothing with it. who thinks that everyone should do what he does and has power over every thing when they really dont. The Vain man is the kinda person that thinks every body should do what they do. Who do those characters remind you of? And i think you are right about what he is trying to say. In the Little Prince, there was someone who was vain. Unfortunately, I know someone like that in 6th grade on the red team. It is a girl and i am not going to name names, but she was on the basketball, and volleyball, b team and she only cared about herself. She thought she was the star athlete for everything. No one really liked her. At first, I thought she was nice. Then i really got to know her and she is definitely like the vain man. All she cared about was herself. She thought everyone came to watch her and only her. All she did was try and coach the team. Everyone thought she was really kind of annoying. Another person I know that is like a character in the book is my cousin. She thinks she is the king of everyone. Yeah, sure sometimes she can be nice, and she is always mean to her brother, and always bosses everyone around, and commands people to do stuff. It just gets really annoying. I love her but sometimes i wish she would leave, me alone. Everyone wishes she would leave them alone sometimes. Someone I know that is like a business man, is my uncle. He lost his job last year, and was doing handyman jobs for people. Like his family, friends, you know, close people. We very rarely get to see him. The only time we mostly get to see him, is when he is over at our house doing work, and at dinner, holidays, and at birthday party’s. He only cares about his handy man job right now, because he doesn’t want to live in the streets, no one does. He likes spending time with his family, but I think him and everyone else, are worried about his job at this point is time. The king is like Mr. King. The king in the story commands things. It is like Mr. King having rules. And also what time things are like the king in the book. That is who I think the king is in the book. Who do I think the lamplight is in the story, I think it is my Mom because she is very hard working. And also the lamplighter is pretty hard working too. They will take and order faster then thunder. My mom basically work’s half a day and the lamplight works day and night. And some time she work’s in the summer. Who do I think is the business person is my dad. He works with numbers. My dad has to know how long the machines go. Also the business man work hard so does my dad. That is who i think is the business man is. I think they are some people that he meant in his early life, they were people that he meet, and they were very important, and i had another thought that they are probably emulsions that he had, and he put them in different bodies and putting them in his books, that’s pretty cool. Maybe he wants us to know the world, there are some good people and there are not so many good people, he’s putting them in his books so we notice them when we are reading. Like the king, he thinks he is the greatest king of all on his planet because he is the only one on his planet, he showing us that people can think what they want to think, but it doesn’t make it true, if you don’t have proof….or if you don’t have other people that believe you.. There is no right or wrong answer here, but it’s your choice. It’s like saying that everybody is perfect in the world, but you know for sure that the whole world is not perfect, so why the only person who is perfect be only you? Doesn’t make sense if you think about it. Like i said, different emotions make feel like you are not of this world. That’s how strong our emotions are, you just have to believe that they are strong as you think they will be. Someone i know is like the king. He thinks the whole house belongs to him. But he knows he has someone that he owns the house together with. He thinks that he knows everything there is to know and can do anything. He acts like he’s the greatest person in the world, too. If he does something awesome or figures something out, and you ask him how did he do it, he says, “Because I can do anything.” It gets really annoying half of the time to the point where you can’t take it anymore. He also thinks he is the most amazing person in the world and can beat anyone at anything, he says that he always beats me in hockey. And he acts like this so much, I start to feel like he just wants to make himself look good. And another thing that makes him to “cocky” about himself is that he never wants to be wrong and when he is proven wrong he either walks away with anger or just shuts up and doesn’t talk anymore. And he’s a grown man and still acts like this. I think that any grown ups that just sit there all day are like the business man. I think this because the business man was always I have no time or that’s not as important. Sometimes grown ups do that to their own kids. And honestly if I have a job like that when I grow up I will make time for my kids and catch up on my work later. I agree about the buisness man too. I think the author of The Little Prince was trying to make the lamplighter represent the good people of the world. He’s trying to make the lamplighter show the reader what a hard worker is like. He represented the people that work hard and are dedicated to do something. The lamplighter doesn’t only think about himself. He thinks about the orders he was told and takes it seriously. In the story, the lamplighter is dedicated on doing his work. He doesn’t take it as a joke. He worked hard and that’s what I think the author was trying to tell the reader. He told them that there are some people that are really dedicated to do their jobs and take it seriously and nothing is going to stop them. I think that is why the author put that character in the book. The lamplighter is a very good person.He took the things that were important to him very seriously. He shows the reader that he isn’t selfish. This shows the reader that there are people that care about things very much and take them very seriously. Some people know that they should listen to what they’re told. There might be pain to the worker but they still do what they’re told and that is a good thing. I agree that the lamplighter took everything to seriously!! I agree with you Sydney about the lamplighter representing a good person in the world. Nice job. KING: he is trying to say to people that just because you think you have all the power in the world doesn’t mean you actually do. VAIN MAN: someone who thinks of only themselves and not other people around them. DRUNKARD: some one who has a bad life and takes their mind off of it by drinking,but for others that might not be the case it might be someone who passed away in their family that they cared about and didn’t want to think of it anymore so they started to drink,but there are many other reasons why people do this to themselves. BUSINESS MAN: someone who has nice things and has many friends think they are the coolest people but really they only think about themselves and think about how “cool” they are. LAMPLIGHTER: someone who is faith full and they think about other people than themselves. GEOGRAPHER: to me this person is lazy and doesn’t want to do any thing or explore. And to me i think the author is trying to say about some of these things on the list is that you don’t need things to be happy. you don’t have to be a drunk to feel good about your self. But you should be faith full in what you do. I think that what he is trying to say is. That you should try not to be like the grownups or in this case the king, the vain man, the drunkard, the business man, the lamplighter, or the geographer. I no some one like the king, the business man and the vain man. All combined together like a banana. For example I ask for water he says no. 5 minutes later he says I command you to get water. Or he will say I command you to get me food. Than he says I on the sun and the stars. Then he says everyone likes me. I think also it is saying shoot for something higher than these people. I also think that he is saying don’t let outer people mess up your true dream. I also think that he says don’t let them them mess you up like him. I also think he is trying to test your knowledge. to see if your a grown up. I think this because he whats to know if it makes sense. That’s What I think about the little prince. I agree what he is trying to say about “grown ups.” Or people that don’t see the imaginary side. I think that the vain man in the story of the Little Prince represents my brother Sam. Also the Drunkard in the story represents my neighbor Bob. These people remind me of the characters in the book because they have many things in common. But the drunkard is in a circle which makes him drink and Bob is in a huge circle which makes him drink. There are a few things that are the same about the characters and the real people. The vain man reminds me of my brother Sam. One thing is that Sam my brother thinks that everyone likes him. He only cares about himself. The vain man also thinks that way. For example I would be talking to my mom about my day and out off no where my brother would say something like hey when are we leaving to go to the store to get all my things i need. And my mom and I would stare at him and say seriously now you are going to say that. He is so vain just like the vain man. The drunkard represents my neighbor Bob. Bob only drinks because of the huge circle he is in. The drunkard himself is also a non stop drinker because he is in a circle that makes him drink more. Also they both are drinking their lives away. Last the drunkard makes sense sometimes but not when he is hung over. Same as my neighbor bob. Someone I know is like the king because she thinks she has all this power yet she doesn’t. Another reason is because she says she can beat up her sisters who are older than her. Another is that her parents don’t let her say bad words but yet she does say bad words on the bus because the older kids do. That is like the King. He thinks he has all the power and when ever he wants some thing to be done it will be done with out a question. That’s the way it works for her. When something isn’t done her way she will also find away to make it happen. The told the sun to set and it did but that happened naturally. That’s what she thinks she always does her best to trick people into doing stuff like she did to my friend. Also like the vain man she thinks everyone is bowing down to her. She is also vain because one of my friends was pretending to be her friend. She as bullied since I have known her. She bullied me then she will want to be friends. Then once she finds a friend she wants to bully me again. That has been going on since I have known her. She also wants to be known so she feels confident about herself. She plays sports that I play so she can beat me. Also to hear her name then she blushes like she hates everyone looking at her. That is like the vain man because he wants everyone to have her eyes on him. Someone else I know is like the drunkard but his problem is that he also is around money. He makes money then he helps other banks make more so they can make. He also is around because I think it makes him feel better. But when he talks to me about I have no clue what’s he saying. That’s real like both the business man and the drunkard he can’t stop thinking about money and all he talks about is money. I agree Emma, I know people too that are like the King,Vain man, and the drunkard. I had friends like that too, it’s not the best but you can deal with it. I agree with you Emma and you Seth too. There are a lot of people in your everyday life that act like Antoine de Saint Exupery characters without you even realizing. What do you think of a Business man? In my perspective view, I think that a business man doesn’t have time for anything. Business people are very serious to me, and doesn’t look like they can have any fun by there job that they have. Some business people I have met in the past are very serious, and don’t joke around about anything. Business people are kinda strange about the work that they do. Business people are focused on what needs to be done, not around them in my opinion. Business people in my opinion, have no time for anything else. A lot of people I have seen are obsessed with working. People would ignore anyone and everyone. Business people are very cautious about the work. I’m sure that if that business’s person’s stuff got taken or stolen he would go crazy mad. The business man in the Little Prince that business man is very serious person, Like most business people are. Being a business man must mean you probably most likely have an awful lot of responsibility. Even though your all work, that work must be important. A business person job could get really boring, at least to me. Going to work would mean putting on a serious face and not talking to anyone all day and barely have any time for anyone else but for me and my work.That’s something I would never be able to do. Having that job to me is a job I would never be good at. I think the king really represents just a regular person just on a small planet. Since he is the only else on his planet. He thinks that no one else is on his planet, he can do whatever he wants. Whenever he wants. I think he represents someone who thinks they have power, that they are the head honcho. But they really don’t have any power. In my opinion the Lamp Lighter is a dedicated person to his work. who will follow there orders no matter what. Even when he is weak and tired he will still do his job. He will work at any cost to keep himself alive. I think the Lamp Lighter really represents a man who will work hard forever without anything. Finally, I think the geographer only cares about the important. Since in the Little Prince, all the geographer cared about was his volcanoes,river, and the big things. But what made the Little Prince mad was the geographer didn’t care about what mattered most to the Little Prince. His only precess thing, the Rose. I think the geographer represented someone who cares about the important things. Not the hidden, only….. numbers. I think the people represent adults because adults don’t have the same imagination as kids. I think the king is his dad because maybe he acted just like him by thinking he had so much power over everybody. Maybe is dad would always boss him around and not let him do anything fun or things like that. Maybe his dad was a very mean and a guy that wanted to have power over everything. Maybe is his dad wanted to rule the whole world like the king does. I think the geographer is Mr. king because all he cares about is the test scores and the geographer in the Little Prince he wont put the flower on the graph because he said it wasn’t important just like Mr. King said that he doesn’t care what our personalities are because its not important. I think that knowing our personalities is way more important. Who cares what they got on there test scores because that doesn’t matter maybe they could’ve improved over that period of time. The businessman is like my mom because the businessman wants to have everything and if something comes out that’s better he wants it. Like my mom when she had the iPhone 2 right when the iPhone 3 came out she went to go get it because it was new and she thought it was way better when there really just the same thing other than a couple of things. The businessman wanted to buy the new stars for no reason and he already had 501,622,731. I think the vain man reminds me of people who think they are all important but they are really not.The examples are like this girl off of this show called suite life on deck called London and she is not very smart but she still thinks she is important because she is rich.Another example is this girl off of a movie called high school musical her name is Sharpe (SHar PAY) and thinks she is important just because she can sing. Also the drunkard are people who are depressed and are doing stupid things.An example is like a person breaks up with a girl so the girl gets all depressed and eats all the time and just watch T.V and cry. I think the lamplighter represents a person who puts work in front of everything.A example is the president of the united states he is always working on something.Also the geographer is like a school board.He only looks at the important stuff that is not really important .A example is Mr. king he is always saying what is their grade instead of looking at where they improved in their work.This is my people and this is who i think they represent. My aunt is like the business man. She always wants stuff. Also most of the stuff she gets is for no reason its just to have it. She bought $5,000 worth of stuff for a party and never uses it. I think she has stuff she needs but most of the stuff she has is useless. Those are the reasons why my aunt is like the business man in the story. My brother reminds me of the vain man. I think he is just messing around most of the time. He just thinks he is so important. Also he thinks that he needs everything and all the attention which he gets. When he is like that it gets really annoying. That is why my brother reminds me of the vain man in the book The Little Prince. I have a great example for the vein man. This kid named Michael is always brags that he’s amazing at everything. But I’m like ten times better than him. He says that he is the most popular kid in his grade but in my opinion there are a lot of kids who are nicer. Plus he thinks he’s so funny when half the time he not funny he’s just trying to be funny. The geographer reminds me of the this school. It does that because what matters to the kids is having fun looking forward to the next year because the older kids told them about the field trips they take. But for sixth grade you don’t take any field trips. All the big people like the principle care about are the test scores because of the money. I think it connects because the little prince cares about the rose we care about having some fun during the school year. The geographer cares about are the volcanoes and the principle cares about test scores. There are many people in this book with special meanings. But the drunkard was kind of crazy. He really didn’t make sense because he drank because he was depress about drinking. I think he made the character to show the lesson if you do something and you get upset you keep doing it. If he keeps drinking its pretty much saying that you cant stop his obsession. Also the business man was very crazy for his thoughts. He was rich and he bought things that were useless. He bought stuff that were useless while he could be buying stuff that were more important. I think he made this character to show that people that buy things or want something they buy useless things. For example, If you win the lottery and you buy stars and other things you get crazy and excited for all the money and you go crazy. Also there was the very vein man,who always wanted attention. The vein man always wanted attention because there is not many people on the planet so when there is people he wants as much attention as he can. When he does things to get attention people can start thinking that he is obnoxious and rude, and he cares for only him self. I think that the author made this character to show some people do stuff like that and you come across obnoxious and rude. Those are the reasons why I think he made these characters. In my opinion I think Antoine de Saint Exupery used specific characters to show his readers that there are people just like the “King,” the drunkard, and the vain man. Some people like these characters are my parents, my friends, and my oldest sister, Liz. My parents have many similarities when it comes to comparing them to the “King.” One of those similarities is that they think they rule the world, which they don’t. Unlike the King, there are other people on Earth. My mom and dad always saw their backs hurt and that they have to clean the whole house because it’s mess when it’s really not. You could tell sometimes when my mom lies because she says her back hurts and then she goes to yoga class. My dad also says that but instead of going to yoga, he goes and workouts. These are only some reasons why my parents and the King are similar. One of my friends that goes to this school reminds me of the vain man. One reason is because she thinks everyone likes her, which isn’t true. She also thinks she’s popular because she swears and is mean to her sisters. She is also mean to anyone who comes in her path and that’s why a lot of my friends aren’t friends with her anymore. Caring about herself is the only thing she knows how to do and also she ever wants is attention. If her team loses in basketball, volleyball, or any other sport, she will blames anyone she can other than herself. My older sister reminds me of the drunkard for many reasons. One being she always stuck in a cycle including money. Her cycle consists of getting money from her university or from work, then spending it on clothes or things she doesn’t need, and then giving money to friends for no reason. For lent she said she gave up spending money for useless things and giving money to friends and family, but like always she failed. On the first Sunday, she bought a hundred dollars worth of clothes that she already had. She also works out a lot at Cardinal Fitness, even though she lives in a dorm house that has a free gym. These are people in my every day life that are similar to Antoine de Saint Exupery’s characters. Which people remind you of them? What do you think of “GrownUps”. I think there very odd or strage with the way they act and think about things. Just like my enimy bobina she is exactly like the vain man. She thinks that everything is about her and only her. She even thought that when she came over to my house that my parents would give her, immebiate respect. But they didn’t so she stoll my awesome sweater so she can wear it when people are adoring her. She practicly is the vain man… I wish she would just quit being full of herself. I also have a “freind” whos name is bobert. He practicly is the king he’s always commanding me to do stuipid stuff. Last time ask to go to a freinds house he told me i have to go to a freinds house. But he’s wrose then the king he even commanded me to go to sleep or go to the bathroom. It makes feel that when i go home i might as well be a dog. If i was alive when he was still a kid i would recomend him to stay a kid forever and never become a grownup ever!!! Also i have a uncle named boberto who is sadly just like the drunkard. He is stuck in the cicle where when he eats he falls asleep and when he and then when he wakes up. He eats more to forget that he has fallen asleep and he is just stuck in this never ending cicle. I wish he could stop but the human body has to eat. So … when i was younger he always told me that if he ever became a grownup to rember him as a kid. Thats my relatoinship with grownups that aren’t really grownups whats yours??? I think that my mom is like the lamp lighter because she has an endless cycle. She goes to work in the morning then comes home, then eats and then go to bed. An this happens every single day for her. But her hours are not like the lamp lighter because the lamp lighters hours is 1 minute per day. An mt mom hours are 24 hours not 1. I also think that the drunkard is like a student in school. There routine is like the drunkard. The drunkard cycle is he drink so he forgets and is ashamed of drinking so he drinks some more. An we do the same thing over and over again. I think the quote means that with your heart you can see if anything is real and true. With your heart you can see what’s really important and not just what you think is important. You could finally see what matters to you and what matters to somebody else, like a friend that has a different perspective than you do. Your parents could want something from you, but you want to do or be something or somebody else. With your heart you can see what you want or what matters to you, don’t look at something through your eyes because you’ll be seeing the wrong thing, look through your heart to see the right thing. I think that if you look through your eyes you’ll grow up to be a person you never wanted to be or plainly just have a horrible personality. Grow up the way you want to grow up, treat other people the way you want to be treated and then those people will know you’ll grow up to be a good person someday. Be a friend have a friend, don’t look at something through your eyes anymore have a new perspective and look through your heart. When someone is feeling down and you see that person with your eyes you may just walk away an don’t even bother to ask what’s wrong. When you look at them again from your heart you go up become friends and look out for each other. Those are the people you want to be friends with people who look out for you and look through their otherwise they’re not your real friend. I think the quote means that certain things can’t be seen though they are there, like how you have a sibling or or relative, you should love them and love can not be seen. Even though their are ways to show someone you love them or at least like them, such as a gift or a wedding ring. 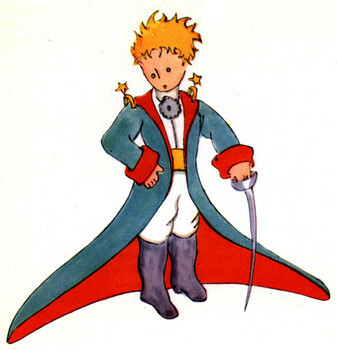 The other example from the book is the little prince to his flower. Even though she may not show it I think she does enjoy what the little prince does for her. Also the little prince is actually quite devoted to her. He still thinks she one of a kind. He regrets leaving her, which I think is a sign of the fact that he kind of misses her.